Posted September 5, 2018 & filed under Announcements, Practice News. You do not need an appointment! We offer High Dose shots for patients 65+! We offer FluBlok for patients with chronic illnesses! Posted February 14, 2018 & filed under Announcements. Posted December 22, 2016 & filed under Announcements, Practice News. 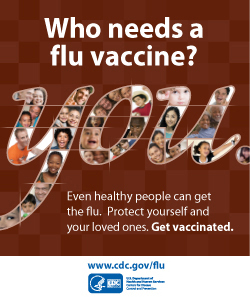 Stop in for your FLU SHOT beginning SEPTEMBER 5th! Posted August 31, 2016 & filed under Announcements. Posted March 16, 2016 & filed under Announcements. Colorectal Cancer is the #2 cause of cancer deaths in the U.S. Screening tests can find this cancer early, when treatment works best. Screening should start at age 50 and continue until age 75 for most men and women. Talk to your clinician if you or a close relative have: inflammatory bowel disease, Crohn’s disease, ulcerative colitis, or a family history of colorectal cancer or polyps. If you have any of these risks, you may need to start screening before age 50. There’s more than one test – you have a choice. Talk to your clinician about colorectal cancer screening. Posted November 25, 2015 & filed under Announcements, Practice News. It’s that time of year again, and Flu shots are now available in our office. Don’t wait too much longer…. Get Your Camp, Sports and School Physicals Done Now! Posted June 12, 2015 & filed under Announcements. The Doctor Is In can accommodate your last minute Camp Physicals and Sports Physicals. Bring in your School Physical Forms and have your child ready to go! Posted March 10, 2015 & filed under Practice News. All 3 offices of THE DOCTOR IS IN have just been Re-Certified by NCQA as “LEVEL 3 PATIENT CENTERED MEDICAL HOMES”. This designation is given to practices that go through a rigorous evaluation to demonstrate their commitment to Excellence in Patient Care. and to our patients – for choosing to receive your care at a practice of excellence. Posted November 27, 2014 & filed under Practice News. Happy Thanksgiving to our patients and staff. Enjoy your turkey… but if you don’t – we are here from 8am to 10pm today – and every day of the year!